Trainees at Curt’s Café South, 1813 Dempster St., showcase their artwork at the exhibition’s opening night. Several artists said they were able to express themselves through their art. 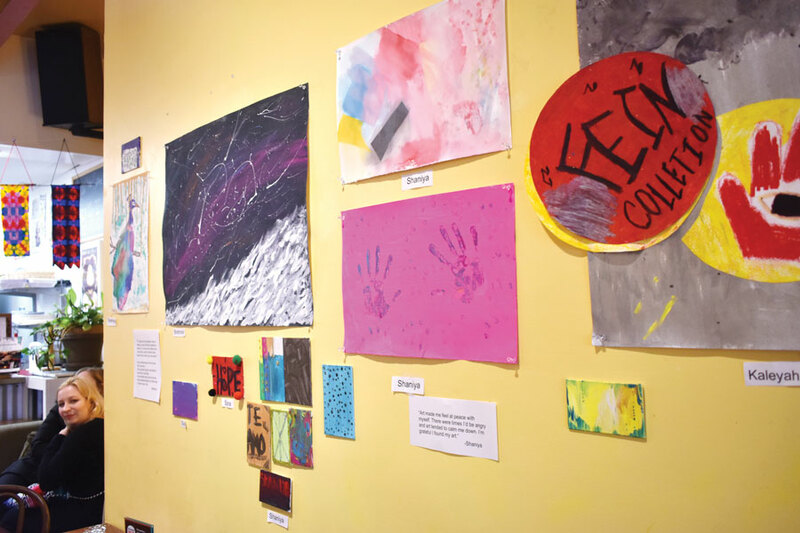 Murals, paintings, sculptures and poems created by young women from Curt’s Café lined the walls and counters of the restaurant Friday during the exhibition’s opening night. About 20 people milled around Curt’s Café South — 1813 Dempster St. — to look at the pieces and discuss them with the creators. The 15 artists, ages 16 to 21, have been working on their pieces for the past 10 weeks during sessions developed by Open Studio Project and Curt’s Café, a work training program for young adults who are at risk. Kaleyah Wesley, an artist and Curt’s Café trainee, said she was glad she was given the space to work on her art. Open Studio Project executive director Chantal Healey said the artists from Curt’s Café attended weekly sessions at the nonprofit arts and social service organization, which uses art as a means of therapy. She said the 15 women who worked in the studio are either trainees or volunteers at Curt’s. Healey added that Open Studio Project utilizes a “non-interference” technique, meaning the studio’s facilitators do not offer comments or critiques while artists are working so they can be free to create what they feel. The Evanston resident said she was glad the program gave these women an opportunity to find peace in their lives. Shaniya Spears, an artist and trainee at Curt’s Café, said she turns to art to calm her down when she is angry or stressed. She added that the opportunity to exhibit her work made her feel proud. Curt’s Café founder Susan Trieschmann said the women’s “powerful” artwork inspired her. She added the program is important because it gave the women an outlet to express themselves when they couldn’t find the words to do so. “In our society, women are often silenced, so this exhibition speaks volumes to the power and strength of these artist,” she said. The works of art will remain on display at Curt’s Café South for the next month until they are moved to Open Studio Project for exhibition in May.